"Do you think I will chase you out using 'rudeness' as an excuse?" "Do you think I will chase you out using 'rudeness' as an excuse?" Last I checked, this character's cosplay outfit was available at Milanoo and Moon Costumes. The above info came from Nicole Recto, and was edited by yours truly (contact me). The image came from Photobucket. Aizen Sousuke was loved by his team. He was loved because of his kindness and sympathy. He was also invited to Hitsugaya's birthday party. A lot of people really liked him and no one suspected him. His lieutenant, Hinamori, admired him. She would be very loyal to him. Aizen started to suspect Rukia's penalty was just a tad too harsh for what her crimes were. He restricted this to Renji, but before he was done speaking to him, an alarm sounded for all the captains to attend an emergency meeting, which has to do with Ichimaru letting the Ryouka escape. Aizen began to speak again but another alarm rang saying there are intruders in the seireitei. After the meeting, when the captains separated to go back to their places, Aizen and Ichimaru crossed each other and began vile hints and threats. One of Ichimaru's and Aizen's plans is to fake his death. Before he did that he wrote a fake letter for Hinamori. As he did that, he used his zanpakutou to make a fake dead body. When Hinamori saw his dead body, she screamed. Vice-captains came and was also shocked. When Ichimaru came, Hinamori remembered what Hitsugaya warned her about and attacked Ichimaru. Then Kira came to protect him. Hinamori and Kira started to fight which is another one of Aizen and Ichimaru's plans. Hitsugaya came in and stopped the fight. They put Hinamori in a detention cell. Matsumoto came in giving Hinamori a letter that Hitsugaya found in Aizen's room. As she read she was surprised when she found out who the killer was. Later on she broke the cell and escaped along with Kira and Renji. Hitsugaya took off to look for Hinamori. When he came to Ichimaru Hinamori came pointing her zanpakutou at Hitsugaya saying he was the killer. Another one of Aizen's plans was for Hinamori and Hitsugaya to kill each other. Hitsugaya knocked her out and fought Ichimaru. After Renji and Ichigo save Rukia from the execution, Hitsugaya found out that everyone in the Central 46 Chamber was killed. Kira distracts him and Matsumoto while Ichimaru shows Hinamori something. That something is Aizen. She was shocked and walked up to him as she did that Aizen stabbed her with his zanpakutou. When Ichimaru and Aizen left, Hitsugaya came back asking where Hinamori was. When he found out Aizen killed her, while he tried to control his anger he questioned Aizen. He asked why he killed Hinamori and answered saying that the easiest way to manipulate somebody is if they admire you very much, and so I took her in as my subordinate. As Histugaya heard that he released his Bankai and was defeated easily. That's when Unohana and Isane came. Aizen explained many things and after he said that he took off with Ichimaru and ending up on Soukyou Hill. Aizen asked Renji to back away from Rukia. He didn't and partly fought with him. He was interrupted by Ichigo. They double-teamed Aizen but was no match. Finally Aizen revealed what he wanted to obtain which was Hougyoku. Komamura came using his bankai. Aizen also managed to defeat him. The other shinigami officials arrived as Yoruichi and Soi Fong stopped Aizen, Rangiku stopping Ichimaru, and Hisagi stopping Kaname Tousen, which is another person that helped with Aizen's plan. Things were going good for the shinigami until a Menos Grande appeared in the sky. 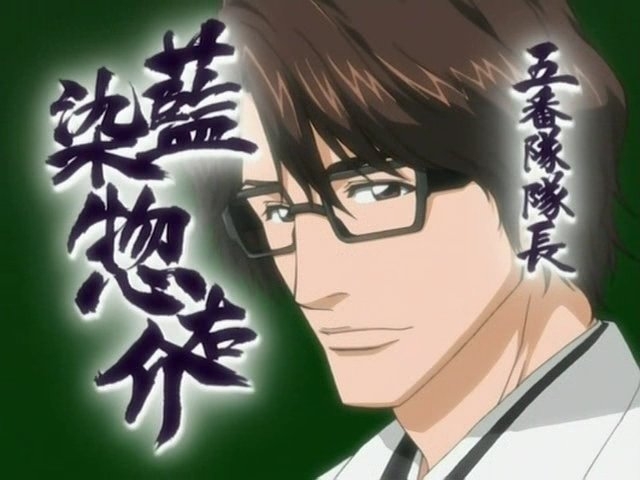 That was when Aizen broke his glasses, changed his hairstyle, and went to the dark side. Aizen hadn't been seen yet. He is now the leader of the Arrancar and his goal is to kill the King and achieve the key. His target is Karakura town. At first glance, Sousuke Aizen is man loved by his team for his kindness and sympathy. In fact, he was one of the few to suspect Rukia's penalty was just a tad too harsh for what her crimes were and confronted Gin Ichimaru about his intentions. But in reality, the man who Aizen seems to be is actually a mask as Aizen was the one who set up Rukia's execution after killing everyone in the Central 46 Chamber prior to her capture. Aizen was bent to obtain the Hougyoku created Kisuke Urahara, who placed it into Rukia's genkai, in order to perfect his experiments of creating beings that combine the powers of Soul Reaper with a Hollow. To further his goals without being suSpected, Aizen faked his death with the illusionary power of his zanpakuto Kyouka Suigestu's illusions. With Gin acting in his stead, Aizen used lieutenant Hinamori as a pawn via his final letter to have her kill Hitsugaya under the impression he was murderer, in hopes both would kill each other. Eventually, Aizen reveals himself to Hinamori when that planned failed, stabbing her with his zanpakuto while she was still shocked and in a state of bliss. After Hitsugaya, Unohana, and Isane came, with his plan falling apart, Aizen takes Gin so they with Tousen Kaname can personally take the Hougyoku at Soukyou Hill, with Aizen overpowering both Ichigo and Renji before ripping the Hougyoku from Rukia. When the Soul Reaper officials arrived as Yoruichi and Soi Fong stopped Aizen, a Menos Grande appeared in the sky as part of Aizen's part. Leaving the Soul Society, Aizen broke his glasses and changed his hairstyle, revealing his actual appearance as well as his intent to destroy Karakura Town as it tied with his goal to overthrow the Soul Society's king. Setting up his base at Las Noches within Hueco Mundo, Aizen uses the Hougyoku to turn his Hollow followers into Arrancar, sending them to the World of the Living to extract information on Ichigo before having them kidnap Orihime in a clever ruse to rob the Soul Society of its strongest fighters and Karakura Town of its protectors, sealing the portals leading to Hueco Mundo to ensure no interference from them. The above description came from fractyl, and was edited by yours truly (contact me).